John Steinbeck's work really needs no introduction. As the writer of the most renowned examples of the rise and fall of the American Dream, his stories are both well-known and (often) very carefully ignored by many. He's the kind of writer one gets forced to read in high school and then abandon because the learning is finished. The beauty and irony of that idea is that Steinbeck didn't stop learning. He worked up an interest in marine biology after The Grapes of Wrath was published, and he sought out ways to learn a great deal. Many modern writers get so focused on the writing deadlines and the press junkets, that they never find time to learn anything new. And if they do it's because they brought in a specialist to tell them why the science works the way the story needs it to work, etc. But it's very rare to find a modern author who writes what they know, or what they themselves have experienced. That type of writing seems limited to the ghostwriters of memoirs on the sale table at Barnes and Noble. No one goes on adventures anymore. Steinbeck's desire to learn brought him into the path of Ed Ricketts (on whom Doc is based) who taught and adventured and collaborated with Steinbeck, and whose character is the heart of Cannery Row. The book is almost less like a novel and more like a magnifying glass on a real place in a real time. On the outside, the novel is about a rusty little fishing town. But inside, as Steinbeck put it, it's "a tide pool teeming with life after the ocean of commerce recedes. 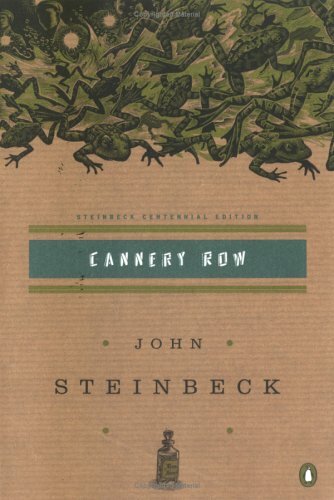 "Unlike The Grapes of Wrath, Cannery Row takes place in one petri dish, one tide pool, bleached by the sun and stinking like the sea. It's the kind of place you might pity someone for living in. But if Steinbeck's writing has ever proved anything, it's that those whom we pity most often have the richest and most colorful lives. This novel is about innocence where it crosses paths with ignorance, and the danger at that intersection. It's ecofiction on a scope that boggles the mind. You don't need a plot to make a good story - not when you have characters like these. You don't need a clear beginning and a clear end, you just need beautifully-detailed people whose habits and mannerisms will stick with you beyond the novel - as if you're recalling a memory of a person you actually know rather than someone who may or may not have been dreamt up. And maybe that's what has always drawn me to Steinbeck - the way the characters sort of float along with you like grimy fairytales, until you stop believing in that sort of thing, and then you're left with the grit that calls on the American spirit to keep adventuring and, more importantly, keep living - even when, maybe, all you have to call your own is a set of curtains on the rusted out boiler tank you call home.